This route will take you through the Counties of Staffordshire, Cheshire, Shropshire and West Midlands. Totalling 129 miles with 113 locks plus one tunnel just under 2 miles long, the ring should take around 2 weeks cruising. When we were based at Tattenhall in Cheshire, a family managed it in one week aboard “The Owl” – but this is fairly extreme! Realisticly, you will find that ten days is the minimum feasible cruising time dependent on canal traffic! Two weeks however will allow a more leisurely pace from Whixall allowing more time for sight seeing and canal side food and drinks. The Llangollen Canal between Whixall on the Prees Arm and Hurleston Junction. The Shropshire Union Canal from Hurleston to Barbridge Junction – and from Autherley Junction in Wolverhampton on your return journey. Middlewich Arm of the Shropshire Union Canal; between Middlewich and Barbridge Junction, Wardle in Cheshire. Trent and Mersey Canal; between Middlewich in Cheshire and Great Haywood Junction in Staffordshire. The Staffordshire and Worcester Canal; between Haywood Junction, Great Haywood, in Staffordshire and Autherley Junction in Wolverhampton in the West Midlands. Shropshire Union Canal; between Autherley Junction in the West Midlands passing briefly through Shropshire to Barbridge Junction, Wardle. Starting from Whixall 1 to 2 days crusing will bring you to Hurleston which allows you the choice of turning North towards Barbridge and the Middlewich branch or turning South down the ‘Shroppie’. Turning North will start you on a clockwise journey around the Four Counties Ring headed for Middlewich along a 10 mile stretch winding quietly through rural Cheshire and a short urban section near the junction at Middlewich before heading South on to the Trent and Mersey Canal. The Trent & Mersey Canal dating from 1776 gave Middlewich a means of delivering its produce, namely salt to the Staffordshire potteries in one direction and the Mersey in the other. Eleven hours cruising and 31 locks ( otherwise known as Heartbreak Hill ) will place you at the North end of the Harecastle Tunnel whose South end is pictured above. The Tunnel, a work of the great Thomas Telford is said to be haunted by a headless woman – something to contemplate on your passage through a mile and three quarters of darkness… apart from your headlamp! 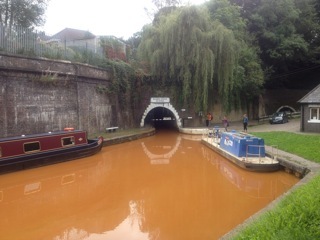 Exiting the tunnel you will wind through the industrial potteries then onwards to rural Staffordshire. After 24 miles and 18 locks in about two easy days heading South will bring you to the junction at Great Haywood where you will turn West onto the Staffordshire and Worcester Canal. The next 20 miles and 11 hours of cruising takes you through open farmland on Cannock Chase heading South, then you will touch the edge of suburban Wolverhampton before turning North onto the ‘Shroppie’ at Autherley Junction. The return to Whixall covering 60 miles, 48 locks and about five days with views as far as the Welsh Marches and some extremely deep cuttings in places – owing to its relative youth, railway construction technology was used in routing the canal directly. As a result, the likes of Woodseaves cutting is 100 feet deep! Heading North takes you via Market Drayton and Nantwich before your final leg.